‘Colour, Continued’, Art Press, November 2017. Published in English and French (see end of feature for the French version). Colour photography is now so ubiquitous we hardly think about it. It would be like asking a fish to contemplate water. Historically, the colour of photography – what it is chemically and what it can be culturally – has been thought about, but only at moments of emergence or transition: the excitement around 1905 about early colour processes such as the Autochrome; the arrival of colour in mass media publications in the 1920s and 30s; and of course, the embrace of colour by the art world that began in the 1970s. One day the history will be written of how, in the space of a decade, art photography left its near cultish faith in the black and white image to a default embrace of colour. But all default positions need rethinking, in art and society more widely. The colours of our visual culture are determined as much by technology and consensus as by the hues of the world that is photographed. Where photographic film and paper once set parameters now it is the digital camera, algorithms, camera pre-sets and post production techniques. But as the range of what is now possible with colour gets wider, society’s palette appears to get narrower. There may not be a ‘hegemony of colour’ but there are certainly ‘consensual categories’, as Jacques Rancière might say, that govern images. Against this consensus, there has always been dissident colour, renegade colour, critical colour. It was key to the avant-garde alternatives to the early mass media, and it is still present. But given how fugitive colour is, in its social meanings and capacity for change, the points of resistance tend to be equally fugitive. For example, Lucas Blalock makes deliberately gauche, non-conformist versions of the advertising still life. The palette and protocols of the genre (what Roland Barthes famously called the ‘rhetoric of the image’) are presented by Blalock as a parody of popular taste and expectation. Roe Ethridge, who moves between art practice and commercial work, is equally attuned to this rhetoric. His books and exhibitions combine out-takes from assignments, more personal photographs and images appropriated from the mass media. The effect is always nuanced in its deployment of colour, setting up an uneasy space that is neither complicit with the mass media nor distanced from it. It’s the mental space of mixed feelings that most of inhabit daily. Lucas Blalock, Two Lettuces, 2014. Courtesy of the artist. For two decades Rut Blees Luxemberg had been exploring cities by night, allowing the strange colours of architecture under streetlight to be further estranged by the way photographic film loses all colour objectivity in long exposures. The familiar city never looks like this to the eye. It is a purely photographic construct. Rut Blees Luxemburg, Eldorado Atlas, 2016. Courtesy of the artist and Dominique Fiat, Paris. Anastasia Samoylova is presently based in Miami Beach, Florida – a place of far-too-happy colours. 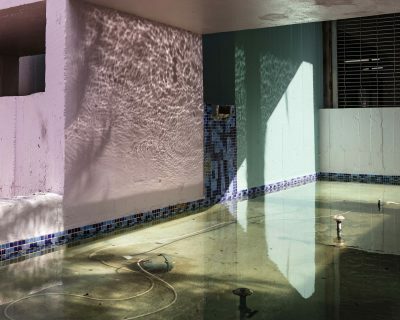 Her latest work, from a forthcoming book, is shot digitally and reflects upon the region’s high risk of flooding. Miami Beach is on an ecological knife-edge and even small fluctuations in sea level are causing severe damage (as I write the region is being battered by Hurricane Irma). Samoylova pushes that local palette into dark speculation, where human life may succumb to unstoppable nature. The flood water and flooding colour become inseparable. Anastasia Samoylova, Untitled, 2017. Courtesy of the artist. Harry Gruyaert, Moscow 1989. Courtesy the artist and Magnum Photos. Although each of these artists has their own approach I think they represent well the possibilities and challenges of using colour reflexively today. Alongside this contemporary work, important older colour photography is resurfacing on new terms. Belgian Harry Gruyaert and the American Joel Meyerowitz have been shooting colour since the 1960s. Gruyaert used 35mm Kodachrome transparency film almost exclusively, until it was discontinued in 2009. Kodachrome was a famously rich and subtle material, but making exhibition prints from it was almost impossible. The darkroom chemistry was just too clumsy. However, the digital technologies that made Kodachrome obsolete now permit what had been shot on that film to be seen in its full richness. Digital scanning and inkjet printing have allowed Gruyaert and many others of his generation to make the kinds of prints they had always wished for. Colour reproduction for published books and magazines has also made extraordinary progress in the last decade or so. Much of that older work looks better than it ever did, and is attracting new attention.